Volume 2 of the Mattie Spyglass series, is a time-travel mythic tale centered around a Babylonian mystery and the Pandora’s box of evil that arises when the Spyglass, an ancient entity is again awakened to power. This book deepens the aspects of wizardy, Jungian myth and magic. Mattie in releasing souls from Nineveh on the 2nd Stone meant for the underworld into heaven has thrown time into Chaos and incurred the wrath of the Dark Master Marduk. The trio of innocence in the form of 11-year olds Mattie, Eddie, a wannabe warrior and Geeta an introspective Indian girl and their guide, the old wizard Biddle journey to the Third Stone on the Path of the Virtuous. Marduk, holds one of the Tablets of Destiny, that of Darkness and seeks the other Tablet to seize all power over the universe. The Hidden Sister who holds the second Tablet of Destiny, that of Light, has been lost. But her whereabouts are known to the Spyglass. Thus, Marduk seeks to capture the Spyglass, and sets his evil servant the Snake Uri Gneezy (and twin of Herman Biddle) to do so. Herman Biddle decides that in order to protect the trio from the snake Uri Gneezy holder of the Black Book of Magic and the satanic Marduk, he will keep Mattie, Eddie, and Geeta trapped in a bubble within the space between two seconds. Biddle leaves to find his ally Professor Wigglesworth to travel the Path to rescue Paddy and Dottie, Mattie’s parents. However, the bubble breaks, and Eddie, Geeta and Mattie are transported in time, find themselves in the basement of the British Museum where they discover Gilgamesh the Seventh King of Uruk, who has laid trapped within the tablets. Gilgamesh befriends Eddie a young muk-tab-lu or warrior, as he is able to handle the magic spear that Gilgamesh holds. Soon they are in the ancient underworld forest of Humawa where danger lurks in the form of the Grim Reaper. Additional plot lines follow the title of the book, the cruel Beast Ashurnasirpal, who is cursed by greed and ego; the tale of Bloody Sunday and the rise of the Stal, Prince of Demons. Mattie and the Spyglass are locked in an angry battle with one another. 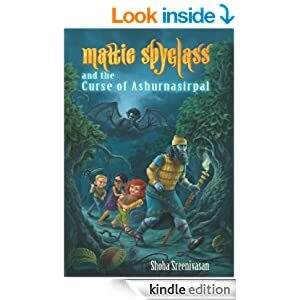 The Spyglass in turn decides that she has to kill Mattie and find a new soul. Geeta cannot help Mattie, though she seeks without success the counsel of her old ThaTha, as they find themselves caught in a flurry of released spirits of the death from the underworld, the effect of Eddie’s living hands holding Deaths’ scythe. The story of Biddle and Wigglesworth and their wizardry is further developed. There is an unleashing of the forces of evil caused by the Chaos, in the form of the forgotten gods of old, they who were defeated by Marduk and plunged into obscurity for the eons. With their rise, and the rise of the battling Gneezy and the Beast, Mattie is targeted on all sides by evil. Book two offer psychological and philosophical insights into how anger divides and provides a fruitful ground for evil to flourish as it ends on a cliffhanger note.